FC Halifax Town were dumped out of the FA Cup first round after a 4-0 thumping at the hands of League Two Wycombe Wanderers at The Shay. Garry Thompson, part of Bradford’s run to the League Cup final two years ago, fired Wycombe ahead as the visitors started in determined fashion. Their supremacy continued, and arguably increased, after half-time and was rewarded with a fine second goal by Sido Jombati before substitutes Max Kretzschmar and Aaron Amadi-Holloway added a deserved gloss to the scoreline for the visitors. Darren Kelly believed his team could spring a surprise if they played to their potential but The Shaymen never looked at their best in a patchy performance that contrasted some good attacking moments with some worrying defensive lapses. The scoreline could have been worse but for Everton goalkeeper Russell Griffiths, who made his debut in place of Matt Glennon for the biggest game of his burgeoning career to date, having never played a senior game at this level before. Kelly insisted the 19-year-old wasn’t coming to the Shay as back-up, and proved it by throwing him straight in. There’s no doubting his credentials, having played for the England under 20 side, but it was a big call to make, and one which contradicted Kelly’s guiding principle so far of adding experience to his side. And Griffiths met his first task with ease, saving a well-hit shot by right-back Jombati that was straight at him. The keeper was comfortable playing the ball out from the back, even if some of the fans in the packed South Stand weren’t, with a lively looking Wycombe attack ready to pounce on any loose balls. Halifax had looked bright in attack, but hesitant in defence, with Wanderers eager to punish any dalliances among the home side, barging into tackles and pressing the hosts around their own box. And hesitancy in clearing the danger was punished as Wycombe pounced on the right of the Town box before the Jombati’s cross found Thompson at the far post, who swept the ball under Griffiths left-footed. Luke O’Nien then headed over from a corner after Griffiths failed to make contact charging from his line. More sloppy play on the ball gifted Thompson possession just outside the box before his low shot drifted just wide of the far post. This was the generosity to which most National League visitors had been afforded at The Shay; Halifax were fortunate not to have been punished more than once. Plenty of teams have been given a goal head-start by The Shaymen this season, and to add Wycombe to that list drastically reduced the chance of a cup upset. Town had barely tested Wycombe keeper Matthew Ingram by half-time, whose only significant contribution was a flying tip-away to repel Sam Walker’s curling free-kick, with the midfielder’s set-piece deliveries their best outlet. 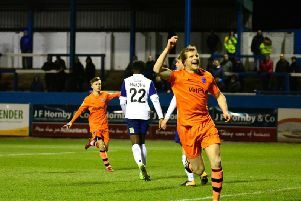 Compared to the blood-and-thunder football against Guiseley in the previous round, Halifax seemed subdued. Had they reproduced their opening-half from Eastleigh, Halifax may well have been ahead as Wycombe didn’t exactly run the hosts ragged. Town upped the tempo after the break and got on the ball higher up the pitch, although a lapse by Nat Brown let in Thompson, whose low shot was well saved by Griffiths, diving to his right. He was on fine form again when Sam Wood jigged through a static Town defence and took an extra touch before shooting, but Griffiths reacted brilliantly to keep out the close-range shot. Thompson did beat Griffiths moments later after again striding away from Brown, but his low shot across goal came back off the post. Town’s goal was leading a charmed life, but that luck ran out with a sublime second goal when Jombati, for his first goal since December 2013, volleyed in to cap a fine one-two on the edge of the area. A one-two of his own with Kingsley James saw substitute Shaun Tuton get a sight of goal, only to be denied by a superb stretching save by Ingram. Fellow sub Kieran Sadlier then curled a shot narrowly wide after dribbling into the box. Had either gone in, Town’s dwindling hopes of an upset may have been rekindled, but Wycombe were easing into the second round after substitute Kretzschmar capped a fine move to quell any lingering doubts. Town were barely heading out with a whimper by the time substitute Aaron Amadi-Holloway outpaced Brown in reaching a high ball before calmly finishing past Griffiths. Halifax: Griffiths, Bolton, O’Brien, N Brown, McManus, K Roberts (Sadlier 74), James, Miller (Tuton 57), Wroe, Walker, Burrow. Subs not used: Glennon, Macdonald, Hattersley, Bencherif, M Brown. Wycombe: Ingram, Jombati, Pierre, O’Nien, Jacobson, Thompson (Ugwu 87), Bean, Bloomfield (Kretzschmar 66), McCarthy, Hayes (Amadi-Holloway 66), Wood. Subs not used: Lynch, Stewart, Sellers.